Do less. Get more. Go raw. Last week was filled with lots of festivities, cookouts and of course, food. Potato chips (I really can’t say no to those Utz! ), sangria, chocolate chip cookies, curly pasta salad…as well as bean veggie burgers on sprouted buns and vegan cheesecake. Celebratingwas loads of fun, but after fireworks, I felt like a load actually. My stomach wasn’t really happy with me the next day. I hate feeling like crap, and my body sure doesn’t like it either! After many years of listening to my body, I’ve learned to honor it. In order to give my body a reboot, I’ve been incorporating more juices and raw foods into my routine so my digestive system gets a break. I can feel the toxins flushing out already! Without cooking and manipulating my food, by doing less, I’m actually getting more. Getting more time in my day because I’m not slaving over a hot stove cooking. Getting more energy (in fact, insane energy) because my body isn’t busy digesting lots of food. 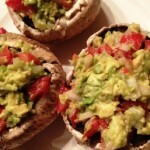 Getting more enzymes with unprocessed, real, whole food. Cooking destroys much of the natural enzymes in food that are needed to break down nutrients. Eating raw eliminates this problem. Getting more regularity (yes, I’m going there). The raw foods I’m eating are packed with tons of fiber. Getting more play time. Since I’m not cooking, there’s less cleanup. Simply put, there aren’t many dishes to wash when you eat fruit and vegetables so I’ve been able to enjoy fun activities (even watching the new Dexter series!). 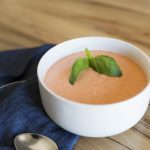 In a blender or food processor, puree all sauce ingredients until smooth. Cut tomato and watermelon into ½-inch slices. Stack alternate layers of tomato and watermelon or just toss together in a bowl. Drizzle with sauce. Top with sunflower seeds and serve. 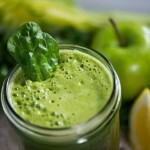 *Signature recipe of Renewal “High Raw” 7 Day Detox. Join me for Renewal “High Raw” 7 Day Detox starting July 21st! How do you reboot after an indulgent summer party? 2 Responses to Do less. Get more. Go raw. I love getting your emails and FB posts…I have my last module at IIN next week and take my final test…then, who knows! I know my target market (baby boomers) but I am leaning more towards workshop type stuff at this point. I look forward to staying in touch. Actually think I will see Joan M at family birthday party at my house next weekend. Take care, keep up the great work and inspiration!